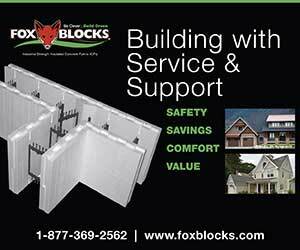 BuildBlock Building Systems now offers an in-depth ICF training course online. 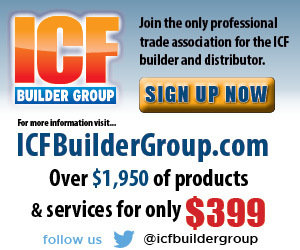 “The BuildBlock Online Training Portal will deliver world-class ICF construction training to anyone at their own pace, from any device, anywhere,” says Mike Garrett, founder and CEO of BuildBlock. To access any course, users simply create a user profile, register for the course and take it at their own pace. The National Ready Mixed Concrete Association (NRMCA) continues to promote ICFs through their “Build With Strength” campaign. Recent efforts have focused on bringing attention to the dozens of multi-story apartment buildings that have caught fire in recent months, and site visits to show that ICFs offer a better option at a comparable cost. In early May, a five-story wood-framed retail-apartment complex under construction in Oakland, Ca. was destroyed for the second time in a year. The previous month, a five-alarm fire broke out at a wood-framed apartment complex under construction in College Park, Maryland. They’re just the latest in a string of spectacular lightweight, wood-framed apartment fires this year – most notably in St. Petersburg, Fla.; Arlington, Va.; Overland Park, Kan.; Raleigh, NC; and Maplewood, NJ. Build With Strength is also facilitating site visits to ICF midrise projects that demonstrate the cost-effective alternative. The first week of May, developers gathered for a multi-family executive roundtable and site tour at a 220-unit ICF apartment complex under construction in Charleston, South Carolina. 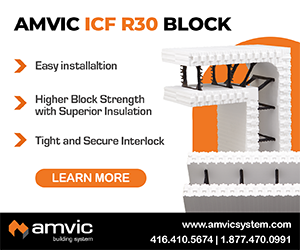 Built using Amvic ICF, company executives were on hand during the tour to answer questions about the building technology. Design Assistance Report for developer David Azar to compare an ICF alternative. Azar ultimately chose to use ICF and concrete for the exterior walls, floors, and demising walls between the residential units. Build With Strength is planning tour of the site with more potential clients in late June. A new educational podcast series on ICFs is available. In each episode, Keven Rector, technical advisor for ICFMA, leads an in-depth discussion about using ICFs to enhance energy efficiency, comfort and sustainability. Listeners can access the newest installments for free at iTunes or PodBean. Why do ICFs Keep Trending Up in Residential Construction? Throughout the series, Rector addresses how ICF technology can solve common design and installation challenges, and integrate with other building products. He also explains how easily contractors can create and install a wide variety of custom form combinations for pools, elevator shafts and more. In April, Logix ICF hosted an online award presentation to recognize outstanding ICF projects built with that brand. “Once again, we were both inspired and informed by some of the most ground-breaking and innovative projects in the ICF industry,” says Andy Lennox, vice president of marketing solutions at Logix. Eight winning Logix ICF projects were showcased in four categories. Lennox notes that the winning projects represent the very best of thousands of Logix projects across North America. The two small residential projects were both extremely energy efficient. The winner, Proud Green Home of Kentucky meets PassivHaus, Net Zero, and NAHB Emerald standards. The large residential winner, Shelving Rock Home, was subject to a full-length profile in the last (May/June 2017) issue of this magazine. The 1st runner-up, Arena Tesoro, was equally impressive. In the multifamily category, a seven-unit communal Hutterite development was edged out by a 181,000-sq.-ft. mid-rise apartment building in Winnipeg. In the commercial sector, Lennox recognized the Cabela’s sporting goods store in North Edmonton, noting that it was one of five ICF stores the chain has built in recent years, four of which have been built with Logix. Top honors in the commercial category went to the Ahmadiyya Mosque. Additional details on all of these projects are available online. Watch the 2017 Logix Awards recorded webcast, or view/download the Logix Awards presentation (PDF file) via the online version of this story. A Southern California ICF dealer is filming a unique video to promote the sustainable attributes of ICF. “We are promoting the idea of building sustainably by utilizing reusable and recyclable products such as Insulated Concrete Forms to provide a better future in living,” says JJ Penna of Forming Solutions, who is directing the film. 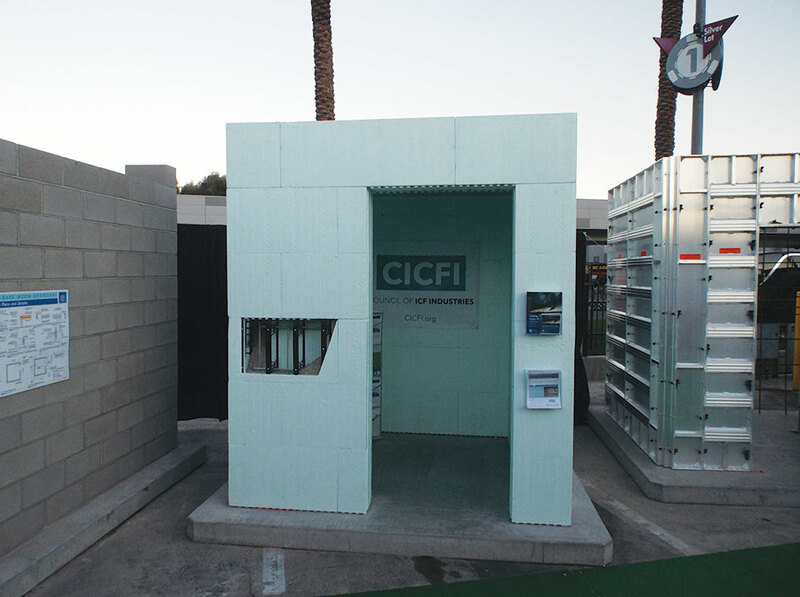 The film is currently in production, and includes footage of how an ICF home is built from all angles, then guides the viewer through the recycling process. Forming Solutions is based in the beach cities of Orange County, so it’s perhaps inevitable that the waste foam ends up recycled into foam surfboard blanks. “We are ending the video with footage of surfing the exact board made and shaped with our recycled foam,” says Penna. This magazine is one of the film’s sponsors. If readers would like to contribute to the project, they can reach out to JJ Penna through the Forming Solutions website. In May, the EIFS Industry Members Association (EIMA) announced that its board of directors approved adding a designated seat for an EIFS contractor. The announcement was made during a gathering of industry contractors and EIFS professionals at the association’s annual meeting. One of the drivers in making this change was to recognize the interest and contributions of contractors in EIMA, with additional hopes of increasing involvement in industry issues and association events.